What a fantastic day to be out fishing. Reports suggest that fishing off Chesil is a bit hit or miss with some nice double figure Smoothound being caught and a few Dabs and Plaice. As predicted the May water is having a bit of an effect on the mackerel fishing. They are on the beach but it is hard work to get them. I was expecting the Bass to turn up this weekend, but so far the have decided not to play. A few have been caught from Osmington Mills, but the normal marks that I would expect them to shaw are just not producing. Longleat Fishing and Country Show: Longleat will shortly be playing host to some of the biggest names in fishing when they launch their inaugural Fishing and Country Show on June 14th-15th. An exciting opportunity has arisen for me to attend what looks like one of the best fishing shows in the South. With a bit of luck and some rearranging of my diary, I hope to attend the show to demonstrate and provide an insight into lure fishing.Longleat will shortly be playing host to some of the biggest names in fishing when they launch their inaugural Fishing and Country Show on June 14th-15th. The show is set to be the largest of its kind in the South of England, providing visitors with the chance to see, and take part in, a variety of carp, coarse, fly and game fishing activities across the three lakes at the front of Longleat House. Designed to appeal to families, the event also includes an Artisan food village with local and International specialty food and drink, cookery demonstrations hosted by Aga with top class chefs, two lakeside picnic areas, and the Land Rover 4×4 Experience. Among those already confirmed to attend are multiple World Freshwater Angling champion Bob Nudd, angling Guru Charles Jardine and the presenter of Sky Sport’s ‘Thinking Tackle’ Danny Fairbrass. A number of other major celebrities are due to be revealed. Co-organiser and double English national Flyfishing champion Chris Ogborne said he is delighted with the number of top anglers and exhibitors who will be taking part. “For two days in June Longleat’s fishing lakes and surrounding lawn, which are set against the stunning backdrop of Longleat House will be transformed into a top class showground that will break the mould of previous fishing-oriented events and will set new standards for a country show. “The principal focus is to showcase the sport of fishing and to attract youngsters and newcomers into becoming the next generation of anglers. “There will be tutorials, live fishing demonstrations and hands-on help with the choosing of tackle. The lakes at Longleat are well stocked and there is the very real probability that youngsters will catch their very first fish here. “At the other end of the scale of expertise, the very top anglers in the sport will be showing customers just why they are at the top of their game. “Members of the England fishing teams will combine with acknowledged experts in the sport to share their skills and to offer tips and advice,” he added. The very biggest tackle makers including Hardy Greys, Korda, Preston Innovations, Sonik and Loop will be showcasing their latest products. Top retailers like Fat Fish, Experience Fishing, Garry Evans and Stockport Fly Shop are also confirmed along with specialty bait makers, flytyers, Trade Guilds and bodies and even a Kayak manufacturer. The good news is that I have managed to get the organisers to provide a special offer for readers of Fishing Tails. The price of the tickets are £17 for adults and £7 for children, but for the first 100 Fishing Tails readers you can get the tickets for £10 and £5 respectively. You need to book through the following link fishing Show Tickets and use the following code ANG001. You will also be entered into a draw to win a £1000 worth of Hardy Grey’s tackle. Even if your other half is not into fishing, there is the added advantage of them being able to visit the safari park. I think that is what you call a win win situation 🙂 For more information on the show have a look at the show’s website. I will let you know more details of my participation over the next couple of days. Chesil Beach forecast: I am sure if you give it a try you will be able to get some Mackerel this weekend. Get some live Peeler and try for a cracking Smoothound. It will certainly help beet the bait robbing Spider Crabs. Fish in Chesil Cove if you want a Wrasse without the massive gear losses you would expect from other areas around Portland. You have a good chance of getting Pollock there as well. Head further West to Abbotsbury, Cogden and West Bexington for the best chance of Plaice and Dabs, with a bonus Ray always a possibility. Portland: We have a good evening tide for the next few days if you wat to try for a Pollock of the Bill. White Sidewinders and Savage Gear Sandeels will be great lure choices. Wrasse are now numerous on the rock marks around Portland, with the Bill being an easily accesible hot spot. Soft plastic lures and Ragworm work very well for Wrasse. Night tides give you the chance of Pollock, Bass and Conger Eels. Portland Harbour: Lots of people fishing around Ferrybridge this morning, but not lot being caught. Boat and Kayak fishing: A great weekend to be on the water. Plenty of Plaice and Tubot coming from the Shambles and Pollock from around the harbour walls. Savage gear Sandeels in White are the killer lure for Pollock like this one. 7 Responses to "Catch report & fishing forecast for Dorset including Chesil Beach, Portland & Weymouth"
Sean, great website, and your forecast for this weekend was spot on! Bloody hard work, no bites, only two large mackerel all day at West Bexington! 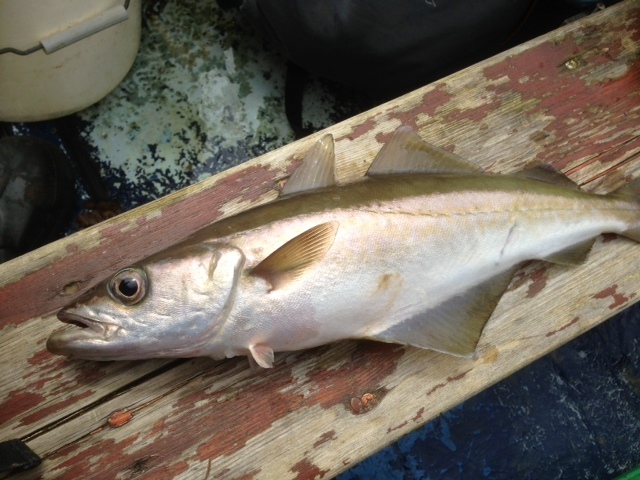 Hi Sean, fished midway between abbotsbury and west bexington, yesterday. Any ideas what the orange gel-like blobs coming back on my line were? Algae bloom, plankton “may water mud” all explanations I heard. Remember similar last couple of years. Keep up the good work on the site, it’s my bible!! Just to say thank you for a great site. For years now I have been looking on the ‘net’ for information on the areas you cover. I used to belong to Chesil beach forum but they were never forthcoming with ‘their catches’ As I am based in London I need good reports before travelling the great distance to places like West Bexington for example. Your work and information for us fishermen out here is extremely important and valuable. Please keep up this good work. Steve. Will the bill be any good for lures tommorow(thursday),if not what would you reccomend. If you are looking for Pollock and Bass, then the Bill fishes best over high water. If you want to lure fish for Wrasse, then low water is best. Hi sean, looking to fish abbottsbury on or close to july 8, any news on catches todate and what should be around july, this is the first time I will fish here after all the write ups, I fish deal and southampton water but would like to try the chesil.